Hive Collective : Tell us a bit about yourself and your business? Lucy Knights : BORN AT DAWN is a website on a mission to help you discover beautiful, effortless style with our edit of unique European womenswear brands. It’s all about slow fashion, wearing what you love and throwing away the ‘trend’ rulebook which in turn saves you money as you get a great cost per wear from your clothes. Buying more mindfully like this also helps you do your bit for the environment by not buying too much throwaway cheap fashion. HC : How long have you had your business and what was the catalyst for starting it? 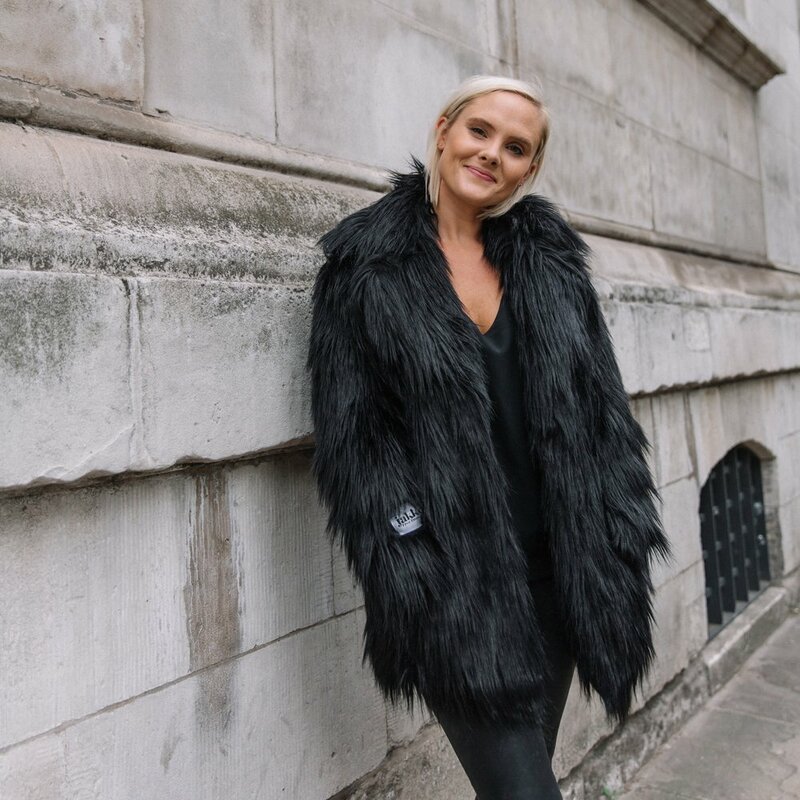 LK : I started the business just over 2 years ago after I saw a gap in the market for busy women who want to wear an alternative to mass market brands and the high street but had no time to seek it out for themselves. I’d always wanted to have my own business and after having my 2nd child and with some savings in the bank- it seemed like the perfect time. It was now or never. HC : What experiences or decisions have been a turning point in terms of taking your business to the next level? The decision to get out there, to network and attend events and create a social media account prior to the website’s launch helped me to create a following beforehand and create a buzz prior to the launch which helped me hit the ground running. I created a vision board when I was starting out in a group workshop with a coach Jessica Rogers to decide what was important to me personally and what I wanted to achieve with BORN AT DAWN and this helps guide me in all my decisions. It’s really important to keep pushing yourself out of your comfort zone and put yourself out there. I hate speaking in public and get so nervous beforehand but I always force myself to say yes when asked to present or be on a panel if I can. I also have a rule about arriving at networking events by myself which forces me to make conversations with strangers- the more you do it, the easier it gets and you meet some really interesting people. I did many pop up events and home shopping parties in our first season to get out there with the product. This helped me get out there and speak to customers, get feedback on the collection and actually meet people in real life, which I believe has helped customer loyalty. You have to be open to pivot and change along the way- I quickly adapt and often tweak my edit of products and brands in line to their performance and my customer’s feedback. HC : What support or help have you had along the way? Southwood Social Hub- Hayley Southwood is an amazing support and champions and supports so many women. Mothers Meetings. It’s great to meet other entrepreneurial Mums in similar situations to me which helped me feel like I had a network and was not alone. At the events- they have a wide range of inspirational women on the panel talking who you can learn from. Business Podcasts. Taking the time out to take a step back and listen to interviews and stories in my own time- helps me reflect, recharge and refocus. Meetups website/app allows you to attend affordable training sessions and events that are more specialised to areas you want to learn about and I attended quite a few in the beginning which helped me. I attended a short Photoshop course at City Lit which has been invaluable to me to do simple graphic design tweaks, improve photos, create flyers, change things on the website, create social media posts. I would recommend everyone with a small business does it. Plus, you can get a NUS card so pays itself back in student discount. The support of my husband and family and friends has been key too. My husband has been massively supportive of me having to work evenings and weekends and take over our house with stock. It is a massive commitment for our family so it is important that he is on the same page. My parents helped me with a start-up loan and came and helped run the business when I was on holiday. My friends support me with spreading the word about my events and often helping me pack up at the end of the day when they are done. As a small business you often can’t afford to pay many people to help so your friends and families support means a lot. HC : How has living in Waltham Forest contributed to your success / journey? LK : Walthamstow is such a lovely area and it was my first experience of a place having a real sense of community since I moved to London-in other areas I lived this was lacking. When I had my children here, I met an amazing network of down-to-earth strong women who were Mums. When I started planning my own business, I realised what an amazing creative and entrepreneurial side the borough had too. So many women were doing their own thing and making a massive success of it- brands like Word Store, Birch & Star, Saw Chocolate, Homeplace Online, Indikidual, Bloom of the Block, Leonie Freeman Photography, Studio Milne, Emily Brooks and many, many more. Being surrounded by these fantastic women pushing their brands forward and making such a success of it can’t help but give you motivation on your journey. With the emergence of brilliant events like Hive Collective’s and Facebook groups like Freelance E17- it’s now easy to connect with others nearby and get inspired. HC : What are your plans for the next 12 months? LK : We’ve got some great new pieces in for Spring-Summer 2019, so I’m enjoying the season so far and looking forward to getting out there with the product at styling events and pop ups.